Porto, Portugal is a city that exudes those fleeting moments we get when creative inspiration hits us. Simply put, Porto is artsy and almost nothing, from store displays to the color on every corner, seems to exist without thoughtful regard to aesthetics. It’s not style that’s paramount in Porto, but an emphasis on the unique; something you can’t help but feel flowing down the Douro River that cuts between the towns of Porto and Vila Nova de Gaia. 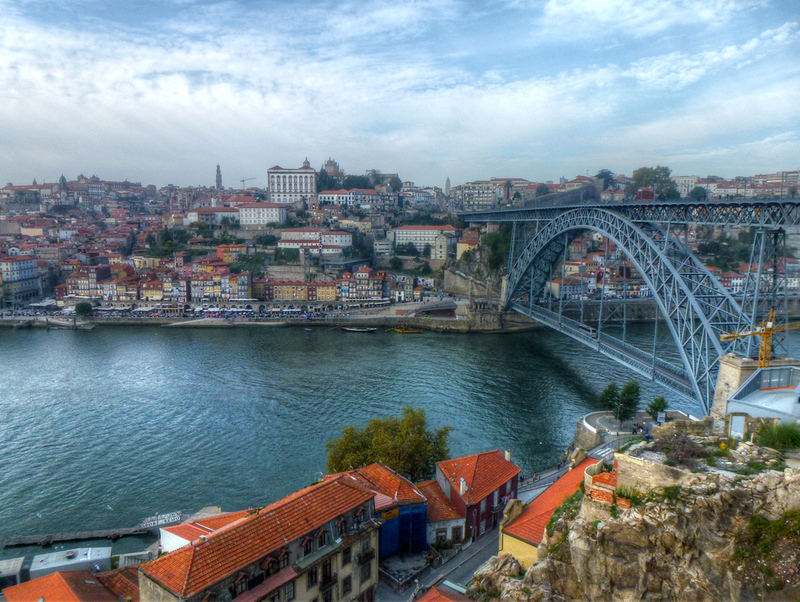 Of course, creativity flows over it too, in Porto’s famous 6 bridges and two in particular. The Luis I Bridge seen above was a joint project between Teophile Seyrig and then partner (and former teacher) Gustave Eiffel. Yes, that very famous man who has a tower in Paris named after him was commissioned by Portugal’s King Luis I to further connect Porto and Gaia. The Luis I Bridge was designed using an innovate and simple plan focusing on only 3 points of weight bearing. Seyrig learned the value of efficiency from Eiffel, a man who had difficulty sharing creative control over any of his projects. More significantly, Eiffel would not share revenue or credit for the Luis Bridge and Seyrig left Eiffel toward the end of construction. Although he was improvising on Eiffel’s design techniques, history has (rightfully) credited Seyrig as the influence behind the Luis I Bridge, completed in 1886. So you may be wondering what the famed Eiffel’s Porto bridge would have looked like? Well, you don’t have to, Eiffel actually constructed the Maria Pia Bridge just down the Douro River – with Seyrig – when he was still a pupil 9 years prior, in 1877. Eiffel’s Maria Pia Bridge was at the time the world’s longest arch bridge and built in 22 months (the Dom Luis took 5 years), and weighs half that of Seyrig’s – arguably intentionally – less efficient design. You can see the differences yourself in this rivalry brought to my attention by ATTTurismo in one of two excellent ways. The first is to climb up to the Mosteiro da Serra do Pilar (Serra do Pilar Monastery) – where you’ll get this view of Porto’s UNESCO World Heritage City Center and Seyrig’s Luis I Bridge. The second is to take a traditional rabelo – flat bottom boats originally used to transport port wine – for a short 30 minute cruise of the river as I did courtesy of Douro Azul and Visit Portugal. These are gorgeous photos! 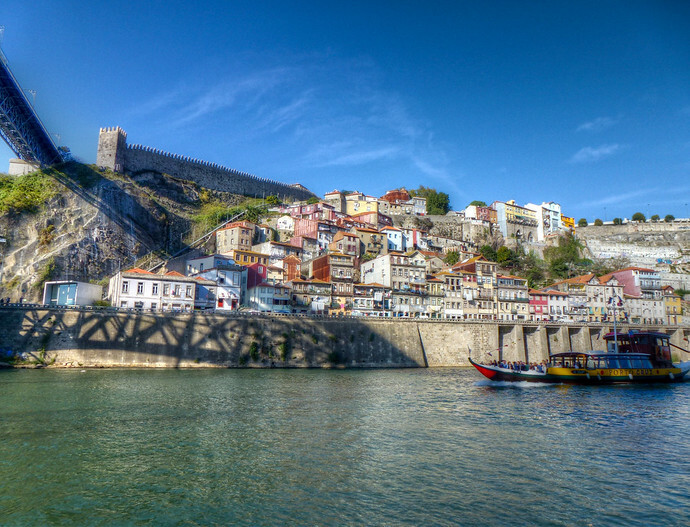 Portugal is high on my list of places to visit in 2012. Portugal looks like such a lovely country. Great Photos Anil, what do you use to process them? Hi Dean, I mostly use Adobe Lightroom. Nice bridge photos. I’ve subscribed on RSS and I’ll be reading your stories. Thanks Rahul, I’m glad you’re enjoying them. I was in Porto in 2016….and the bridge was my favourit place visited almost every evening for a month. I love Porto and her people.